Each jewel we make starts as a small block of precious metal. This block is pressed into a plate or a wire in the desired thickness. These plates and wires form the basis of each jewel. We forge these into the needed components of the jewel. For example: the band of a ring, the prongs of a setting and the small rings that hold the prongs into place. We carefully polish each component to a mirror finish, even the parts that wont be visible in the finished jewel. Once all parts are ready, we solder them together to form the complete jewel. This is once again polished in order to create a perfect result. Over 99% of all jewellery, including those marketed as ‘handmade’ or ‘high jewellery’ are made by some form of casting. With this method jewellery is made by making a mold of a prototype of the jewel into which molten metal is injected. The resulting piece is then finished and polished. This method is far less labour intensive as real hand-forged jewellery. A simple solitaire ring can be made in under 30 minutes, while a similar ring would take between 7 and 12 hours to forge entirely by hand. The great disadvantage however is that casting makes a metal brittle. This means a casted jewel is much more fragile and prone to wear and tear than a forged jewel would be. That’s why at Van der Veken Jewellery we never cast. Each jewel is always crafted entirely by hand. The fact that we can offer great craftsmanship is of course thanks to our master goldsmiths. What makes them unique is their talent, passion, eye for detail and last but not least: their training. After they have completed their formal training in a craft-school, we select the most promising candidates for our own three year internal apprenticeship. During this apprenticeship we not only improve their basic jewellery-making skills, we also teach them our own specific methods and trade secrets. We strive for perfection with every jewel. This is evident in our decision to work with only the best materials. The diamonds we set in our jewellery are of the highest quality, as are our precious stones. We only work with platinum and 18 kt gold. Other materials, like silver, don’t meet our quality criteria to be made into jewellery. Of course each producer can choose to work with extraordinary materials. But that alone does not ensure that the finished jewel itself is of superior quality. 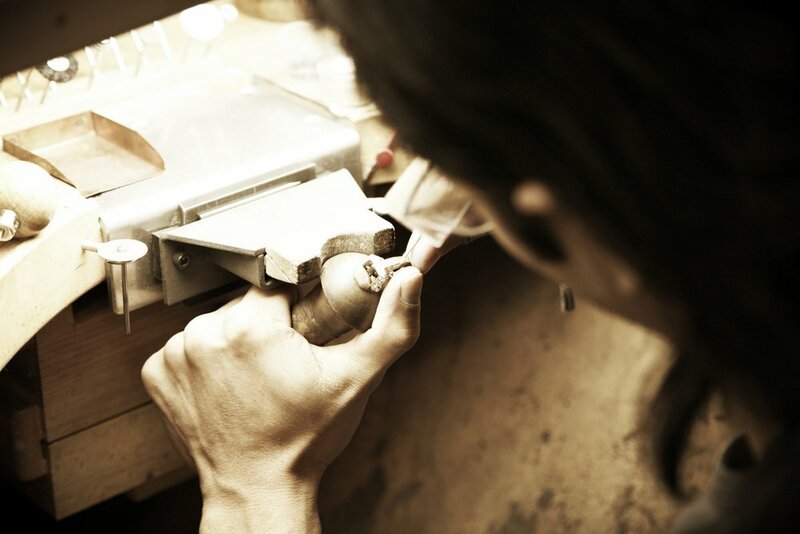 The highest level in jewellery can only be achieved by using artisan craftsmanship. This makes the jewel stronger, more refined and better protected from wear and tear than any other production process can. The resulting jewel is without equal. A unique piece that is truly exclusive.